Saturn’s ice moon Enceladus is being slowly devoured by the gas giant’s rings, according to a series of new NASA images that show ghostly tendrils escaping the moon’s cryo-volcanoes and shooting off into space. Wow. Enceladus may be a 310-mile across baby of a moon, but it’s been enjoying a lot of buzz lately. Like Jupiter’s Europa, Enceladus is thought to harbour liquid, and possibly life-containing oceans beneath its icy surface. What’s more, a network of cryo-volcanoes on its south pole are constantly pumping out tiny chunks of ice-water and simple organic molecules at a roaring 800 miles per hour. Scientists believe these volcanoes are dredging up ocean water from deep beneath the surface, making them a tantalising target in the search for alien life. But those oceans probably won’t be there forever, because now we have direct evidence that the ice volcanoes are quite literally pumping the moon’s water off into Saturn’s rings on a one-way journey. The images above, which were captured by the Cassini spacecraft and published last week in the Astronomical Journal, show long, sinuous tendrils of ice dust originating from the moon’s south pole geysers and reaching into Saturn’s massive E-ring. 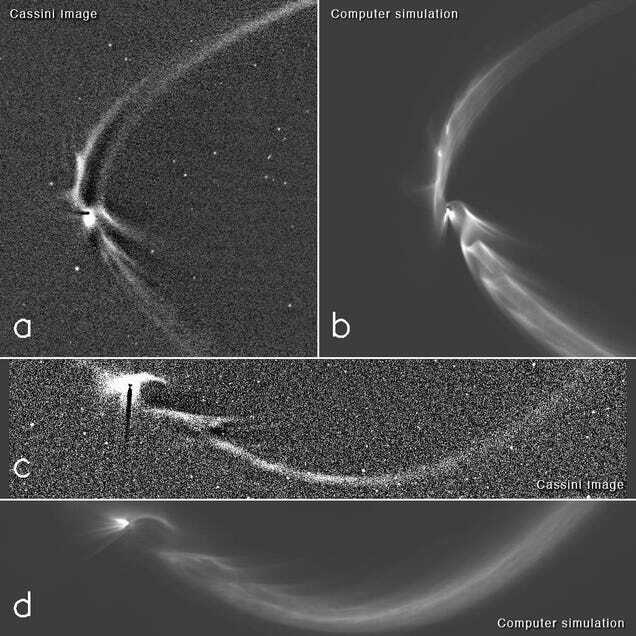 This collage, consisting of two Cassini images of long, sinuous, tendril-like features from Saturn’s moon Enceladus and two corresponding computer simulations of the same, illustrates how well the structures, and the sizes of the particles composing them, can be modeled by tracing the trajectories of tiny, icy grains ejected from Enceladus’ south polar geysers. The figures labeled “a” and “c” are computer-enhanced images of the tendril structures near Enceladus that were taken at high solar phase angle (174 and 170 degrees, respectively); figures “b” and “d” are synthetic (computer-generated) images produced by following the trajectories of tiny, icy particles ejected from the 36 most active geysers (representing the top 50 percent of the moon’s total geysering activity) found on the south polar terrain. The match between real and synthetic images is quite good and strongly supports the suggestion that tendrils are produced by the moon’s geysers.